With the original voice of Mickey Mouse, sings and dances 8 different songs of his friends of the Mickey Mouse Club House, and explains 8 different adventures. 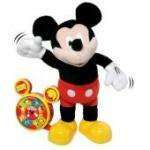 Mickey moves its mouth and arms to the rhythm of the music. Very easy to activate with 8 different buttons to choose the story or song you want to hear. Batteries included.